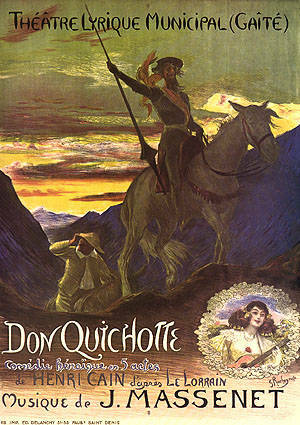 I’m heading north to catch today’s matinee of Jules Massenet’s 1910 comédie-héroïque, Don Quichotte, at Seattle Opera. In this pair of clips, we can see and hear two of those noted interpreters in action. First off is van Dam, who in this 201o production from Brussels, attempts to do battle against a giant windmill blade at the end of the second act. His hapless Sancho is Werner Van Mechelen. And from a 2002 concert performance in Moscow, Nicolai Ghiaurov sings Quixote’s moving Death Scene in Act 5, with his wife, Mirella Freni, providing the off-stage voice of Dulcinée. Chaliapin’s recorded legacy of Don Quichotte is also worth noting–three excerpts running to just over 18 minutes worth of music–as it documents a highly melodramatic style of performance that has long since fallen out of favor. There are, unfortunately, no video clips of Chaliapin in the role, but his powerful portrayal of Cervantes’ knight errant from G.W. Pabst’s 1933 film adaptation of the novel–with music by Jacques Ibert–will do in a pinch.